As the creative hub of London’s East End, you’ll never be short of things to do in Shoreditch. Check out London Top Sights Tours list of the 10 best things to do in Shoreditch so you can plan the perfect itinerary after a tour of central London! London has some fantastic markets, many of which began operating hundreds of years ago. Old Spitalfields Market is no exception. There has been a market running on the same grounds as Old Spitalfields Market since the 17th Century! Back in the Victorian era most of the stalls sold fresh produce, but the modern day market is now host to multicultural food stalls and independent artisans selling jewellery, books, and clothes. The mix of history and unique stalls makes it one of the best things to do in Shoreditch! 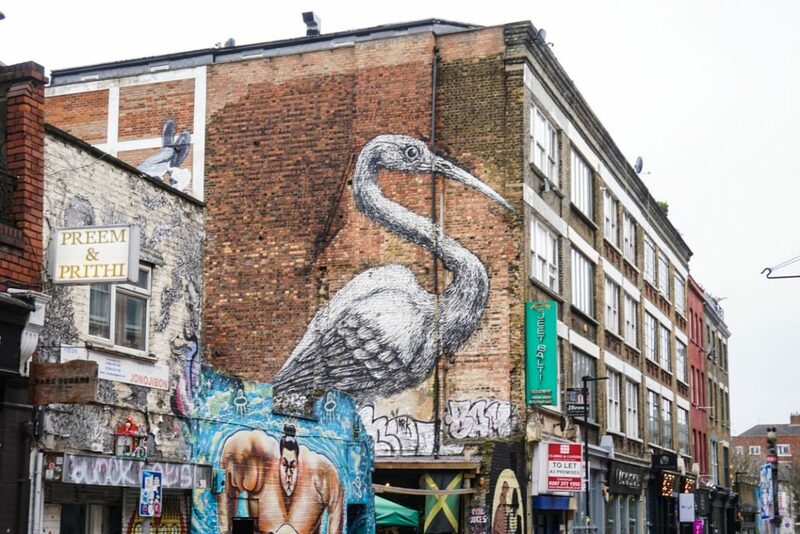 One of the most popular things to do in Shoreditch, for both locals and visitors, is to check out its street art. You can find it everywhere around Shoreditch if you just wander and keep your eyes open. World-famous street artists like Banksy and Nathan Bowen have left their marks here, as well as many up-and-coming artists. New art appears every day, and is often around corners and down alleyways that most people walk right by without noticing. It is entirely possible to visit three different places in one night, have a great time and not even leave Hoxton Square. With Red Dog Saloon serving up some crazily juicy burgers, The Breakfast Club dishing out fluffy pancakes topped with crispy bacon, and Zigfrid von Underbelly sliding out cool beverages in one of the most unique interiors in the city, Hoxton Square has all the ingredients for a perfect night out. While the sport is typically associated with pensioners on a cruise, shuffleboard has found new life with London’s young people in this Shoreditch establishment. Old Truman Brewery has the classic floor shuffleboard while the Little Shuffle Club has four tables of table shuffleboard for you to play while you enjoy a pint. There’s also food and DJs that keep you fed and entertained as you play. 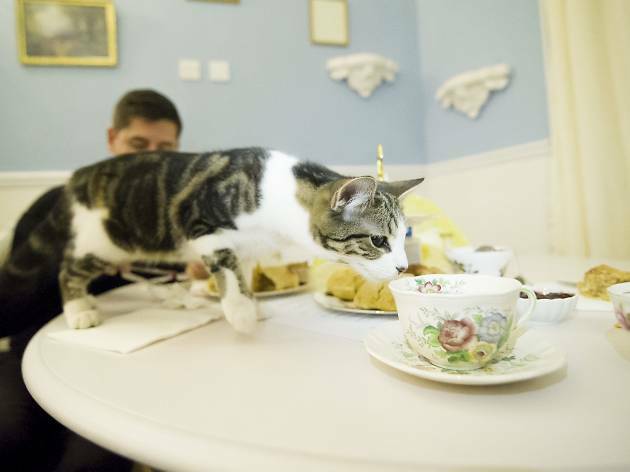 Animal cafes have become something of a trend over in Asia, but Britain has its own take on the phenomena with this tearoom full of furry felines. The café has thirteen cats that occupy the restaurant, lounging, sleeping, and requesting head scratches as you enjoy your tea and scones. Its popularity means you’ll definitely need to book in advance or you’ll find yourself on the waiting list. As well as its great restaurants, Shoreditch is famous for its street food. Brick Lane, home of much-loved bagel institution Beigel Bake, hosts a huge market every Sunday offering global street food from Canadian poutine to Thai delicacies. On top of their outdoor eateries, there are also enclosed market areas on and around the famous street, from Backyard Market to Sunday Upmarket. Here’s an odd fact: in the 1800s, the name of Petticoat Lane was officially changed to Middlesex Street. The rumour is that it was a result of prude Victorians wanting to avoid any mention of petticoats (which are ladies’ underskirts). But whether or not this is true, the street name change wasn’t really accepted and to this day the market continues to take its name from Petticoat Lane! But considering that a clothing market has been running here since the early 17th Century, you can see why Middlesex Street Market never caught on. Generations of stall owners have called Petticoat Lane their home since then, despite the fact that the market wasn’t officially recognised by the government until 1930. Apparently it was quite the place for dodgy East End dealings so before then the police were more likely to try and shut it down then acknowledge it as an official place of business! The world’s first pop-up mall, this shopping/eating/drinking hub made entirely out of shipping containers is certainly one of a kind. Boxpark plays host to some of London’s most popular food pop-ups, including CookDaily, an eatery selling vegan dishes from around the world. For afters, try Soft Serve Society, a dessert spot selling the infamous freakshakes and plenty of other creative versions of popular desserts. Boxpark also hosts parties from various DJs, festivals and event organisers to help you let your hair down after a long day of eating and drinking. There aren’t many better places to spend a night out with the guys and girls than Queen of Hoxton on Curtain Road. There’s a bit of something for everybody, be it ping pong, a retro arcade machine, its mini club in the basement or its restaurant on the roof. Queen of Hoxton is the place to be.